This is my No. 3 value pick for 2017. 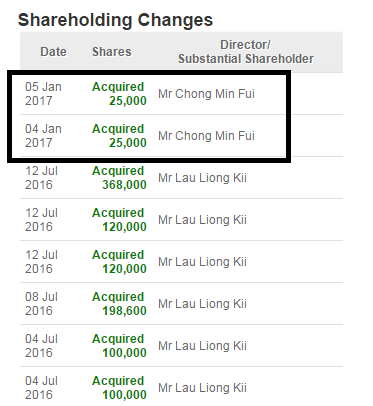 Considering CCK is the business of poultry, may the year of the Rooster of 2017 help push the share price up. I will start of by clarifying that many of my private subscribers and early readers know I called to enter CCK back in December 2016 when it was 61 sens and set an intial TP of RM0.70 which was achieved in January before retracing. Hence, in interest of transparency, I am writing to let all know in advance. So why am I still writing the article now? I contemplated writing it but as most readers know, Tradeview is value investing group that focuses on investing in companies for the business and to be true shareholder. 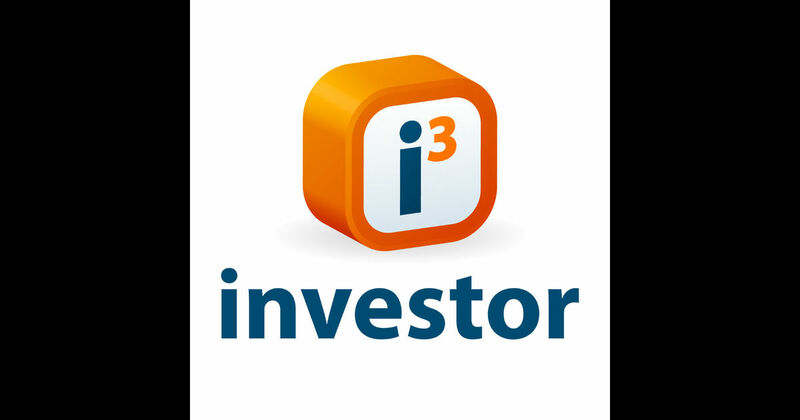 We do not punt / speculate but aspire to invest in a business that we take pride in. You can see from all my earlier recommendations such as Yee Lee, Magni, Visdynamics, Allianz, EG and now CCK. I am writing to share about CCK simply because I like the company. Period. CCK is an East Malaysia company that focuses on poultry, aquaculture and frozen food. The founder is a respectable self made entrepreneur who happens to be the owner of Nam Cheong shipbuilders as well. As of this year, CCK would be celebrating its 20th year being listed on Bursa. The management consist of experienced personnel who have been in the industry and the company for more than 30 years. In short, CCK is well run. Looking at the latest QR, CCK truly delivered stellar results following their successful acquisition of an associate company which contributed significantly to the topline and bottomline. 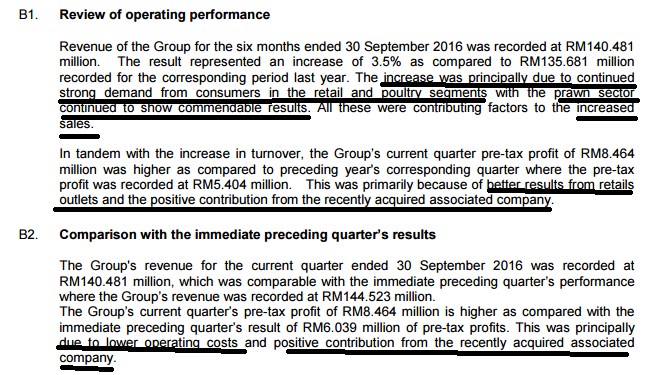 The best part, CCK used internally generated funds (cash) instead of borrowings to acquire a profit making associate company, Gold Coin Sarawak Sdn. Bhd. With the addition of Gold Coin, CCK's businesses now has expanded to 4 segments namely Poultry, Aquaculture for Export, Retail Consumer Frozen Food and Animal Feed / Grain. Another key reason I like CCK is because their expansion of business moves along the chain of businesses which is textbook Vertical Integration. For the past 3 years from 2014-2016, CCK has shown steady growth in terms of Revenue and also Profit. 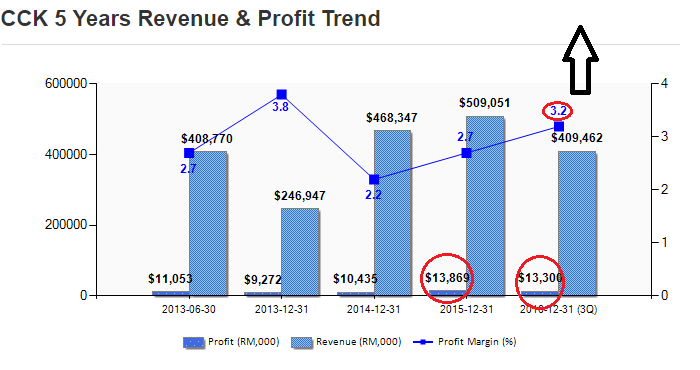 Profit margin has been improving too from 2.2% to 3.2%. Based on the latest QR, for 3 Quarters alone, CCK has achieved a revenue of RM409 Million and Profit of Rm13 Million vs the Full Year 2015 Revenue of RM509 MIllion and Profit of Rm13.8 Million. What I am trying to point out is that CCK will have no problem at all achieving a record year in terms of both topline and bottomline. Such successful showing is exemplary considering they delivered a great year in 2015 resulting in a bonus issue. Having done that, CCK likely can exceed expectation in terms of their performance for the whole of 2016. 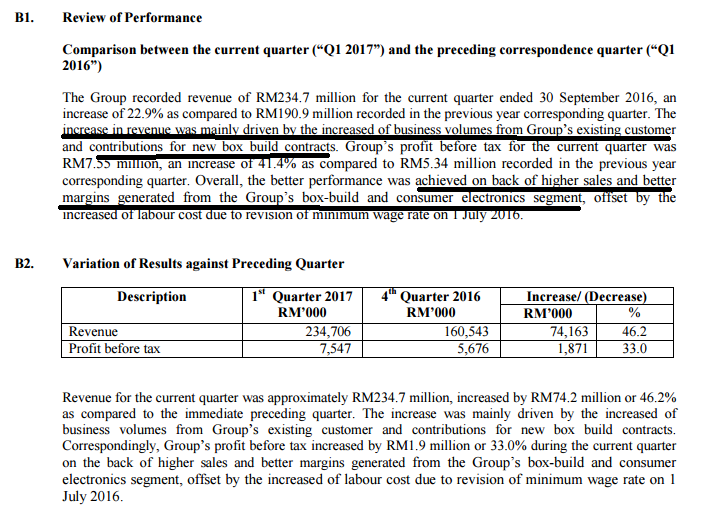 Looking at the numbers, Revenue for each quarter in 2014 averages around RM115 Million, each quarter of 2015 averages around RM125 million and for 2016, following the acquisition of Gold Coin, it would seem that CCK has moved another level to average RM140 million for the quarter. EPS after the dilution impact of bonus issue, stands at average EPS of 2 sens per quarter. If we were to annualise it, I am confident for the full year it would come up to 8 sens for 4 quarters. 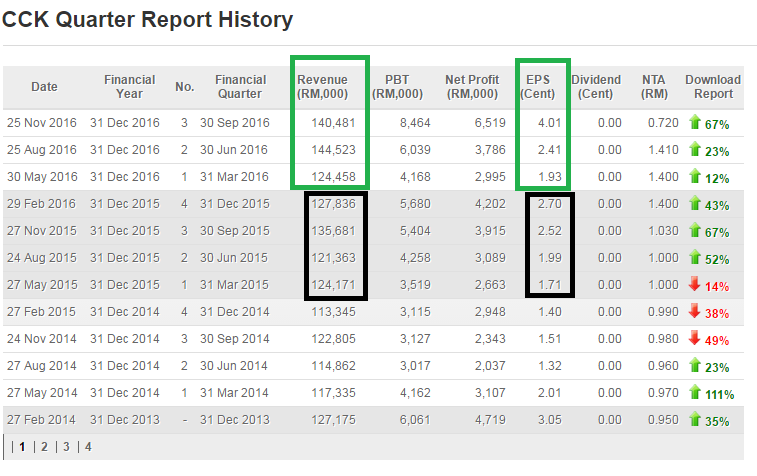 At 10x PE multiple, the Fair Value of CCK should stand at 80 sens. Given the difficult economy, the business that CCK is in is very resilient as it is mainly necessity based. Others are catering to export markets which also would thrive under the weak MYR. With Gold Coin part of the business now, CCK has also taken care of their cost (animal feed is key cost component for a poultry business). Such a holistic and well managed business shows the foresight and vision of the company's management. If a company can take care of the cost, anything extra would directly go to the bottomline. 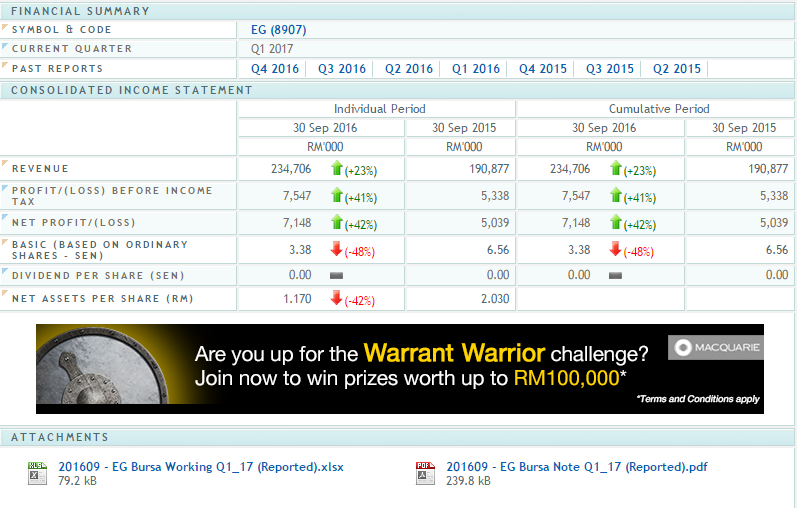 Additionally, the company has solid dividend history, hence, I am quite confident for 2016, CCK will declare good dividend as well. In my opinion, CCK is also a commonly misunderstood company as the company gives off the impression of a poultry company. While CCK has business in poultry, farming etc, Their key contributor is actually their retail (consumer food, frozen food, meat / poultry). Which means, CCK actually owns the whole value chain from production to final touch point with the consumers through their retail arm. This is extremely powerful business model keeping cost to the lowest possible. As we review the performance in their latest QR, what is clear is the retail segment performance + the new associated company helped boost the overall performance of the company. This may be the case, however, the overall increase of the sales is also due to the strong performance in all 4 business segments of CCK. Quite obvious, CCK is on the right track with their business plans and strategy. In today's climate, the Management remains confident in their future prospect which to me is a big plus point as most companies are not bold enough to make a declaration of positive indication. From this statement, I think it could not be anymore clearer as the Management has indicated FY 2016 will be better than 2015. A small plus point would be that substantial shareholders have been adding position albeit small positions. There is also rarely any sell off by the substantial shareholders of the company which shows the confidence the shareholders have towards the future of the company. 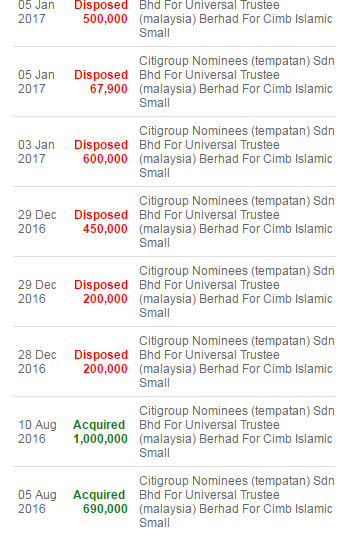 At current price of RM0.645, CCK is only trading at 8.1x trailing P/E after taking into account of the dilution of bonus issue. For a fully integrated poultry chain, the valuation is indeed cheap. If I choose to be more conservative to take only the last 2Q and annualise it, it would be trading at 8.7x forward P/E. Both valuations shows CCK is undervalued. I believe CCK is a continuing growing business which is well managed with unique business proposition, as such, I would forecast a full year 8 sens EPS. With 10x PE multiple, the Fair Value of CCK should be 80 sens. This valuation excludes potential future growth and dividend to be declared. I will set the initial TP for 2017 to be RM0.80 for ease of reference. 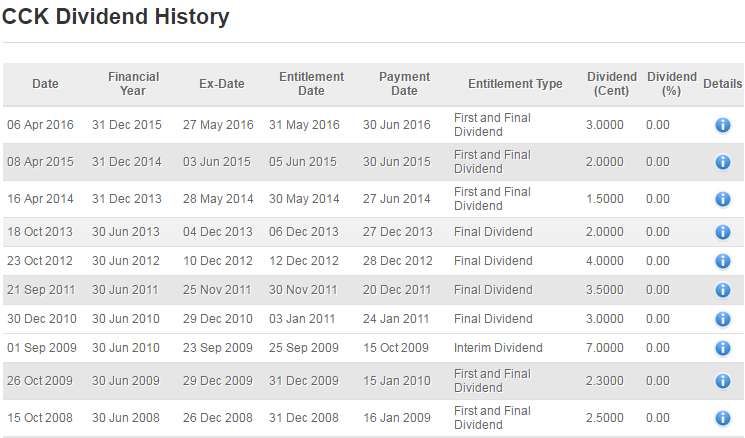 Assuming CCK maintain their dividend payout as per last year of 3 sens, at current price, the DY is 4.65%. The recent retracement was already within my expectation following the sharp increase from 60 sens to 70 sens which was my intial TP. Therefore, any price weakness, may be a buying opportunity.